President Barack Obama likes to see himself as a moral leader. "The arc of the moral universe is long," Obama likes to say, quoting Martin Luther King Jr, "but it bends toward justice." 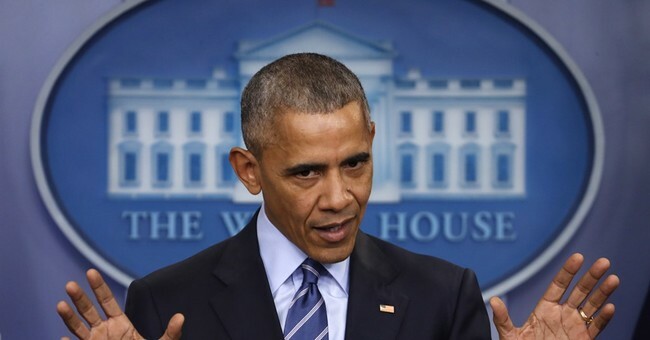 According to Obama, Obama is a genteel representative of decency and good grace, a man pointing America toward a broader vision, a fellow questing for social justice and contextual consideration. In reality, he's a narcissistic fool. And like Burgess Meredith's character in "The Twilight Zone," he will be left standing in the ruins, bewailing the fates that abandoned him, leaving no worshipful admirers upon whom to lean. Obama's legacy is one of failure all around the world. He leaves office with a genocide in Syria on his record -- a genocide he pledged to prevent, then tolerated and finally lamented, mourning the fates while blithely ignoring his own cowardice. Libya, meanwhile, remains a full-scale disaster area, with tens of thousands of refugees from that failed campaign swamping Europe, along with those fleeing Syria, and his leftist European allies paying the political price. Iran, the world's leading state sponsor of terrorism, stands on the brink of a nuclear dawn, its pockets filled with billions of dollars, its minions ascendant from Tehran to Aleppo to Beirut. Obama made that happen with nearly a decade of appeasement and a willingness to abandon freedom-minded Iranians to the tender mercies of the mullahs. Meanwhile, Russia has only expanded its reach and influence, invading the sovereign nation of Ukraine and seizing Crimea to the deafening silence of the Obama administration. Russia has flexed its muscle in Kaliningrad, where it has stocked missiles, and in Syria, where it has assured Syrian President Bashar Assad's continued dominance. China has grown its sphere of influence across the South China Sea, putting American allies from Taiwan and Japan to the Philippines directly under its thumb. Thanks to Obama's military cuts, China believes that it can bully American allies into embracing Chinese supremacy in international waters -- and it may be right. Simultaneously, Obama continues to drive America into debt, and the Chinese are large buyers of that outstanding debt. The communist Cubans have been re-enshrined; so have the socialist Venezuelan authorities. The Islamic State group remains an international threat, and western capitals have been struck by Islamic terror time and again, to Obama's teeth-gnashing and general inaction. But at least Obama is truly putting his focus where it's necessary: on declaring that our only ally in the Middle East, Israel, has no historic claim to its own existence and threatening Jews with sanctions for building bathrooms in East Jerusalem. Obama came into office amidst grand promises to restore America's place in the world. Unless our place is the outhouse, he's failed. But at least he feels good about his accomplishments, even if thousands have died -- and thousands more will die -- in order to ensure his moral stature in his own mind.